Hollywood star of Ghanaian descent, Boris Kodjo has been officially unveiled as the Ambassador of film for Ghana. Minister of tourism, arts and culture, Hon Catherine Afeku unveiled Mr. Kojoe in the presence of a few other ambassadors. The internationally acclaimed Hollywood actor, had paid a courtesy call on the Minister at her office whilst in Ghana. Little did he know that he was going to become the tourism ambassador for Ghana Films. Madam Afeku began by eulogizing the celebrated actor for being a brand and and icon. She proceeded by soliciting the latter to take up the mantle as Ghana’s Film Ambassador. “I’m honoured to be the ambassador for my nation, but to achieve results it must be a team effort so I am looking forward to working together with all stakeholders”. Known in real life as Boris Frederic Cecil Tay-Natey Ofuatey-Kodjoe, Mr Kodjoe, is an Australian-born actor of German and Ghanaian descent. He is popular for his roles as Kelby in the 2002 film Brown Sugar, the sports-courier agent Damon Carter on the Showtime drama series Soul Food and was a recurring character on FOX’s The Last Man on Earth. He currently co-stars on BET’s Real Husbands of Hollywood and on the CBS medical drama Code Black. 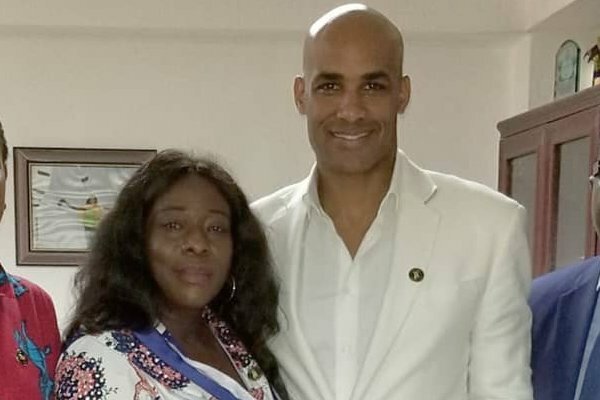 Kodjoe was born in Vienna, Austria, the son of Ursula, a German psychologist of partially Jewish descent, and Eric Kodjoe, a Ghanaian physician who is a Krobo.